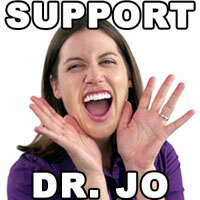 Sponsored Content: This video represents the honest opinions of Doctor Jo. Thank you to Thermotex for sponsoring this video and providing Doctor Jo with a free Thermotex Platinum and Foot Unit to use/review. If you purchase the products using the links/ads below, Doctor Jo will receive a commission. Click here and use discount code DOCTORJOX to get $30.50 off the Thermotex Platinum + FREE shipping! Click here and use discount code DOCTORJO to get $20.50 off the Thermotex Foot Unit + FREE shipping! If you have these foot ailments: peripheral neuropathy, arthritis, hammer toes, strains and sprains, and achiness, then this video will show you 5 ways to help relieve this pain including using far infrared heat. Here are my top five ways to help relieve foot pain. First is a calf stretch. You can stretch your calf several different ways. This stretch will be with a strap. Start off with your leg out in front of you. Keep the leg you want to stretch out in front of you. Take a stretch strap, dog leash, belt, or towel and wrap it around the ball of your foot. Relax your foot, and pull the strap towards you stretching your calf muscle. You should feel the stretch under your leg. Hold the stretch for 30 seconds, and do three of them. The second way to relieve pain is to use Far Infrared Heat. Far infrared heats the area with light vs. actual heat, so it can penetrate deeper into the area. A traditional heating pad usually only heats about 0.25 cm, but far infrared can go up to 6 cm, or 2.36 inches. It helps increase the circulation to the area to provide temporary relief. The Thermotex Platinum and Foot Unit are both great devices that use this Far Infrared heat therapy to help relieve pain. Click here to watch my full review for the Thermotex Platinum, which also features more detailed info about far infrared heat. Next is ankle pumps. With your legs straight out in front of you, place a roll just under your ankle so your heel can move freely, or just hold it in the air. Trying to keep your leg straight and moving only at your ankle, pull your foot up towards you, and then push it down like you are pushing on a peddle. Start off with 10, and work your way up to 20-25. Now you will do heel/toe raises. For seated heel/toe raises, start off by lifting your heel off the floor while keeping your toes on the floor. Next, you will do toe raises, bringing the toes off the floor with the heel on the floor. If these become easy, you can do them standing. The final exercise will be a balance series. Stand on one foot, but hold onto something sturdy. Try to balance for 30 seconds to a minute. When that becomes easy, just use one finger one each side. Then just one finger for balance, and finally try balancing without holding on at all.